When you get your nostril pierced, you are making a puncture wound in a thick piece of cartilage. Cartilage piercings take significantly longer to heal than those that go through a flap of skin, like an earlobe. If you remove a ring from a nostril piercing that is less than 6 months old, the hole closes within a matter of days. If your piercing is healed, the hole on the outside of the nostril might stay open for several weeks. Removing the ring from a new nostril piercing can cause it to close up within 24 hours. The inside of the nostril is lined with mucous membranes, which seal shut quickly without jewelry in them. The hole on the outside of your nose will remain open longer. Some people still have a hole on the outside of their nostril years after the inside hole has closed, particularly if their piercing had healed when they removed the jewelry. The outside hole can become a small scar that looks like an enlarged pore. 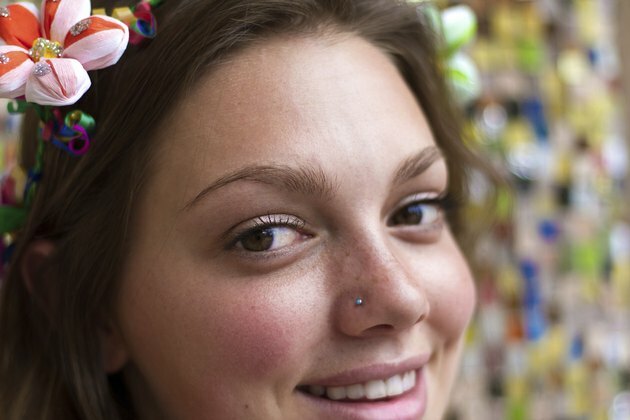 The two pieces of jewelry commonly used for initial nostril piercings are nostril screws and captive bead rings. A nostril screw looks like a straight pin with a blunt end. The piercer measures the thickness of your nostril and bends the end of the pin into a U shape with pliers. The screw goes straight through the nose, with the curve holding it in place inside the nostril. A C-shaped captive bead ring uses pressure to hold a bead between its two prongs. If you have been wearing a nostril screw in your piercing, you might be more likely to have a scar even after you remove it. The Association of Professional Piercers recommends soaking new piercings once or twice a day for 5 to 10 minutes at a time in a saline solution made of 1 cup of warm bottled water and 1/4 tsp. non-iodized sea salt. For facial piercings, it is easiest to make a compress out of sterile gauze and hold it against the piercing. Clean the inside of the nostril with the same solution on the end of a cotton swab. After soaking, wash the outside of the piercing with an antimicrobial soap. If you have removed your nostril jewelry due to irritation, continuing the aftercare for a couple of weeks can help reduce inflammation and redness, and might help prevent scarring. If you have a new nostril piercing and have left your jewelry out for a day or more, your piercing might require reopening with a taper. If you want to try reinserting your jewelry yourself, wash the piercing, the jewelry and your hands with antimicrobial soap and warm water. Dip the end of the ring or nostril screw into a drop of soap to lubricate it, and gently try to insert it into your piercing. If it doesn't slip through easily, visit your piercer right away. She might be able to reopen the hole with a taper, which looks like a blunt-ended needle and is used to stretch piercings. If your piercing is oozing green or yellow pus, has swollen excessively or is hot to the touch, you probably have an infection. The swelling can cause a nostril screw to become embedded in the skin, which can be painful. Although you might be tempted to remove the jewelry to allow the piercing to close, doing so could trap the infection inside and lead to abscess, which is particularly dangerous in cartilage. Your piercer can change your jewelry to a ring to relieve the pressure. Continue with your aftercare until the infection clears up, and then remove the ring if you no longer wish to keep the piercing. If the infection persists or you have fever or chills, consult your doctor.